By definition, core words are useful in any situation, with any topic and any communication partner. They are the perfect words for Earth Day because they are words that they we re-use and recycle. Even though it is a very minor holiday (at least in the US), most schools do a lot of thematic work around the topic, both because it ties in so beautifully with science education, but also because all kids seem to have a connection with and curiosity about the natural world. Before we knew better, SLPs would spend lots of time programming specific vocabulary into the learner’s AAC device. (I’m guilty as charged and can still remember trying to find symbols for things like trash compactor and pollution.) For learners who have good command of core vocabulary, we may certainly target academic vocabulary related to Earth Day (e.g., recycle). But for many learners, our focus is learning to use core words (e.g., ‘use it again’ instead of ‘recycle’). In this post, let’s consider how we might do that with Earth Day related books. There is no shortage of wonderful books for Earth Day. 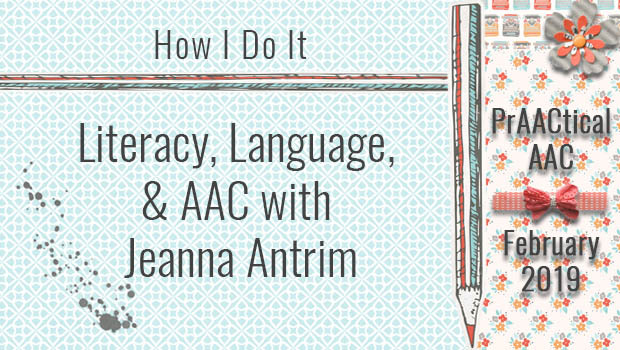 Check out Amanda Hanley’s list for younger learners. For older learners, download a free issue of this middle school science education magazine, National Inquirer, from the US Department of Agriculture Forest Service. Tarheel Reader is another great source of books for this holiday. SOME of them are weird! TELL me about your favorite. DO you FEEL like reading some more? DO you think HE lives IN a tree or IN the ground? You can also target specific core words or phrases and practice them throughout the book. For example, if the April target words for this lesson are WHO and DO, we can model them and elicit a phrase like “I DO.” Here are some examples of things we might say to give practice with that phrase. Want to get in some more practice? Consider making up a song, chant, or poem that goes along with the book you are reading. Add a visual support and lots of repetition and you have some additional practice to build fluency with your target core words. Here are some examples. “DO we recycle? Yes, we DO! The Earth is our home so DO your part. Respect the planet with all your heart. Saving energy. DO your part. Recycling paper. DO your part. Bike or carpool. DO your part. The role of visual supports is key here. Making the language visible helps learners with literacy but also helps them know when to fill in their part of the chant, poem, or song. Do you have ways of incorporating core vocabulary, reading, and an Earth Day theme? We’d love to hear about it.